Over the past 15 years, different marketing platforms and tactics have risen and fell. There’s one channel, however, that’s withstood the test of time; email marketing. Email marketing is absolutely essential to the long term success of any online business. The ability to maintain a list of contacts and customers will ensure you are able to build a relationship that enables you to grow. When it comes to email marketing services, Aweber and GetResponse are two of the best email marketing services to choose between. So, how do the two services compare, and which would most suit your needs? I’ve used both Aweber and GetResponse extensively across various side projects and client projects, so I thought I’d compare the pro’s and con’s of each below. Both email marketing services charge recurring fees, so overall cost could be a major factor in your decision. While the pricing structures can appear complicated at first glance, they are based on the number of subscribers you acquire. Typically, your business will generate more revenue as your list grows, meaning the extra costs will be absorbed. Aweber offers a basic package of up to 500 subscribers for $19 per month ($1 for the first month), an extra $10 for a further 2000 subscribers and additional increments up to $149 for between 10,001 – 25,000 subscribers. GetResponse offer a 30-day free trial, after which you would be paying $15 for up to 1000 subscribers, $25 for 2500 and then additional increases as your list grows. Both Aweber and GetResponse have large enterprise packages, suitable for high volume customers, and also offer discounts if you sign up on an annual basis. Overall, GetResponse is slightly cheaper than Aweber, but there is not a vast amount of difference between the two. Aweber has developed a great reputation for the simplicity and usability of their service. They have continually looked to make things easier for their customers, while also adding to their graphics and templates options. One of the major benefits of Aweber is the ability to make things as simple or as complex as you require. If you want a ‘set it and forget it’ email marketing service, you can simply use their drag and drop system to quickly load a series of emails. 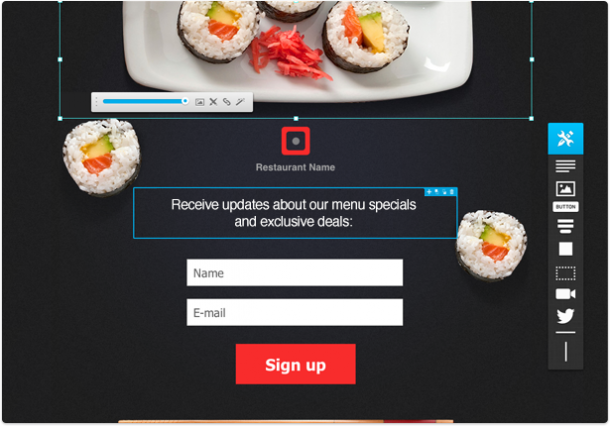 Templates and email opt-in forms are in abundance and look slick and professional. However, if you want to use their HTML editor you can build emails to your own specification and send them at specific times of the day for optimal results. 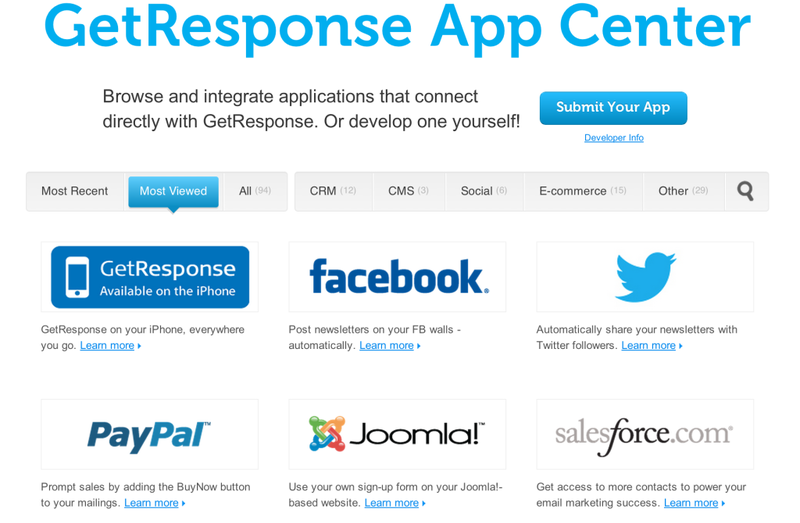 GetResponse, in previous years, had a reputation for being slightly less user friendly and provided limited options in terms of templates and opt-in forms. They have addressed these issues though, and introduced ‘Autoresponders 2.0’, which is a huge upgrade. 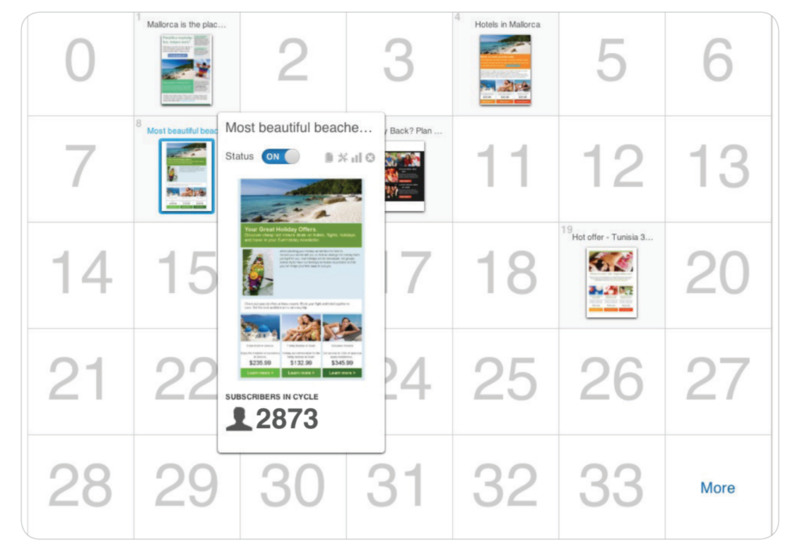 The scheduling uses an attractive calendar system, making things very clear and intuitive for all levels of user. There are plenty of nice templates and graphics to suit a variety of markets and also for generic use, while their scheduling and cycle management is as sophisticated as Aweber offers. We have come to expect beautiful design when it comes to reports and analytics online, so it is no real surprise that both Aweber and GetResponse provide ample graphs and tables to help track emails. They are both well formatted, so you can quickly and easily find out a great deal of information without too much effort. The usual data is available – email open rates, unsubscribe rates, which links were clicked – but there is also a great deal of extra important information, including what your return on investment (ROI) is, found by placing a tracking code on your website. Both services offer a huge deal of reporting options, but GetResponse may just edge this as they have put a great emphasis on their ‘Intuitive Email Intelligence’, which really delivers. Email marketing and promotion, in its simplest form, does not require a great deal of work when a campaign has been set up. But if you want to really make the most of your campaigns and generate a high ROI, learning to manage your subscribers effectively is essential. Aweber allows you to segment your lists in a variety of ways, including who opened your emails, where they are located, what product they purchased and more. When you first begin to collect email addresses, Aweber allows you to add custom options in order to segment people onto different lists. This is particularly effective as you can then create custom emails to really hone in on a niche, providing a more personal experience for the reader. GetResponse also provides a vast array of options for managing and segmenting your list. They offer very similar options to Aweber, also allowing the option of creating multiple groups so you could create an almost unlimited number of segmented groups for extremely focused targeting. This could get very confusing, but thankfully GetResponse, and also Aweber, make the segmentation rules easy to follow and you can start very simply before adding any complexity. If you have lists from other email marketing services or address books, Aweber and GetResponse will also allow you to add them to your various lists, making list management a breeze. The contacts will be required to confirm they wish to be added to these lists though, to be compliant with the relevant rules. If you want to be able to create landing pages, you’ll need to go with GetResponse, as Aweber doesn’t offer the ability to build landing pages. For me, this is a deal breaker as it’d take hours coding landing pages manually, and the landing page editor on GetResponse makes it quick and easy to build a landing page that matches our design. Currently, GetResponse offers over 100+ landing page templates, all of which you’re able to customise without needing any HTML knowledge. 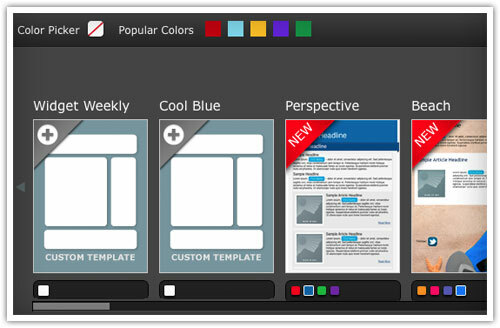 All of the templates are mobile responsive, and can be A/B tested. For many customers, integration with a 3rd party service is essential. Aweber allows easy integration with the popular shopping carts like Paypal, 1 Shopping Cart and Authorize, so you can add customers to a list. As all business owners know, a list of buyers is extremely valuable and this integration allows this to be done immediately. A customer can make a purchase and receive a ‘Welcome’ email from your Aweber buyers list right away. You are not limited to shopping carts either, as Aweber has a variety of social apps allowing you to get new subscribers from sites like Facebook and WordPress. GetResponse also do a great job of integrating with 3rd party services. They have an ‘App Center’ which features various eCommerce and social sites that you can gain subscribers from, and the functionality is excellent. They currently list 94 different websites they support, including major names like Google Checkout, Amazon Payments and WordPress. Aweber and GetResponse have excellent integration services but the sites they support do not always overlap, so make sure to check both services if you have a particular need in this department. If one site does not offer integration it is highly likely the other does, especially if you are dealing with a well known 3rd party company. Changing your email marketing service is something you typically will only want to do as a last resort. For this reason, it is hugely important to make the right decision from the beginning. As you can see, Aweber and GetResponse have earned great reputations for a reason – they have continued to develop and innovate their products, while putting functionality and usability at the forefront. If price is a major factor for you, GetResponse currently offer a slightly more affordable service. The difference may be negligible but recurring costs can add up. Aweber has a slight advantage when it comes to design and template options, though GetResponse has made considerable improvements and much of the difference is now down to personal taste. The core services they offer in terms of deliverability, segmentation, analytics and scheduling, are now at a very even level, meaning you can use the services to a very advanced level and not suffer a loss in performance whichever company you use. Both companies have clearly spent time and money to stay ahead of most of the competition. If you are still unsure about which option to take, you may like to make use of their trial options. 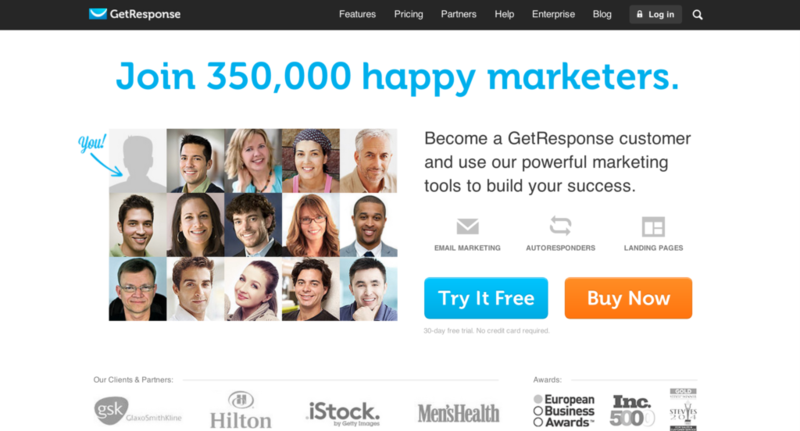 As mentioned above, GetResponse offers a 30-day free trial, while Aweber charges $1 for the first month. This can be a great way to get a feel for the products before you make the final decision. I had recently posted an article as well regarding these two Autoresponders comparison. You had mentioned about Integrations which I didn’t cover in my post. On the other hand, I personally think that the Time Travel feature from GetResponse is quite important to mention in the review as well. Thanks Alan, spot on – Time Travel is an awesome feature, and definitely scores Get Response a few extra points. I remember a few years ago trying to recreate the ‘time travel’ effect manually in Mailchimp by scheduling about ten identical email campaigns to different segments based on country. Nice that they’ve solved that one! Thank for the information ,time to review this worth gold ……..
We’ve used Aweber for years and despite looking like the ugly duckling of the email marketing world, we love it. There is one thing that you may want to update in your review – Aweber does allow basic split testing. They also have great email deliverability rates, although I don’t know how they compare to GetResponses. Thanks a lot! After reading this I decided to buy GetResponse! I cannot differentiate between Aweber and GetResponse. Both are really good email marketing tools. But I think GetResponse is a bit of a better tool. Thank you very much for a detailed comparison between this 2 big autoresponders showing us both sides of the coins for each this tool. I had been using Getresponse for a number of years and still find the calender scheduling kind of confusing to use. I’m in the midst of a business switch, and I’m leaving what my list knows me for (author stuff) for products around overcoming self-sabotage in business and using hypnosis for pain management. Thus I am starting my lists almost from scratch. To save money, I am leaving 1shoppingcart, and will try both of the above solutions. However, I’d love some advice on which shopping carts are the optimal ones (and least costly) for each of the above autoresponders. Getresponse has lost its magic guys and girls – I signed up in 2007 and still have an account (with nothing in it though) as their deliverability has really nose dived. Check their sender scores – like 60-70 and some worse than that…they should be 95+. Rubbish open rates – 1% in getresponse vs 7% in aweber for a 1 year old list. When I asked them about it they sent a generic response about it being my complaint rate causing the issue (my complaint rate funnily enough was 0.00% in getresponse ha!) – they’ve really lost their credibility – stay well clear is my advise.